Serving as a music therapist for a Jewish hospice has turned out to be among the most rewarding personal experiences of my professional life. Each day I travel to nursing homes, assisted living facilities and into people’s homes with my guitar in hand. I meet the most amazing people through my visits. In addition to singing and playing instruments together (I give them percussion instruments to keep time), we often talk. I love to learn about the people for whom I play, about their lives and histories, their talents and passions. It helps us forge relationships and connections. I recently visited a gentleman who told me that before he retired he was a journalist for the New York Times and an author. But when I asked him what he wrote about he could not remember. So I decided to do some research on my own when I got home. Lo and behold I learned that not only was he a prolific New York Times journalist and a graduate of the Columbia University School of Journalism, but he had also been a speech writer for a Vice President of the United States! Once I learned that another client (a man in his 90s) shared my passion for baseball, there was much to talk about. He had been a minor league player and shared stories from his youth when he saw Babe Ruth play. We now begin each visit by singing Take Me Out to the Ballgame. 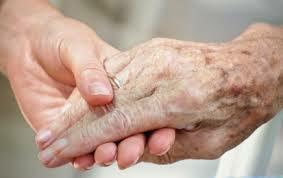 My hospice work reminds me how beneficial it is to really connect with people in a deeper way – beyond the superficial. I am learning so much life’s wisdom from them. I am inspired by their experience and life stories. I am able to connect with them and lift their spirits so much better when I get to know them. That’s why a recent story on the front page of the New York Times really struck a chord with me. Perhaps you also saw the poignant article about the lonely and solitary death of a Mr. George Bell. He lived alone and his decomposed body was found many days after his death. Each year in our country there are myriads of people who die alone in unwatched struggles. No one collects their bodies and no one mourns the conclusion of their lives. They are just another name added to the death tables, and last year George Bell, age 72, was among those names. George’s story of solitary existence at the end is unfortunately an all too common story for seniors. They are often the ones who die with no one holding their hand, not a family member or a close friend present. From the detective-like story it seemed that George Bell was a kind, generous and humorous man. He loved his parents, cared for his mother through her final illness, worked hard and had some good friends. However, he was unable to share his innermost feelings with his closest friends, who slowly disappeared from his life because of their own deaths or relocation. My recent hospice visits in juxtaposition to Mr. Bell’s solitary end is a reminder to me that everyone has a story. The person sitting across from you on the subway, the crotchety neighbor down the street, the cashier in the supermarket. They are not nameless faceless individuals – they all have stories and talents and gifts and experiences. While we cannot reach out to everyone, it is important to reach out to our relatives and neighbors, fellow community members and congregants – anyone who could use a personal connection. Anyone who may be in a situation similar to Mr. Bell’s whose social circle has diminished — so that they have dignity in their final days. These musings bring me to thinking about our Jewish tradition. The High Holy Day liturgy includes a prayer that pleads “Do not forsake me in old age.” According to the Bratslaver Rebbe, the prosperity of a country is in accordance with its treatment of the elderly. May we do our part to reach out to those who are alone and lonely. I promise you, it will benefit you as much as it benefits them. Ever since primitive people discovered how to fashion instruments to create musical sounds, music has held a special power. This has been especially true for the Jewish people. Moses, Miriam, Deborah the Judge and King David the Psalmist all celebrated personal deliverance through their songs (and sometimes with dance). The Psalmist claims that he can solve any riddle with his harp (Psalm 49:5). We often think that riddles and problems are puzzles that require a single solution after much analysis. How can I wear my new shirt if the collar is smaller than my neck size? What is the best way to fit all of these gifts into this box for shipping? We are usually able to figure it all out through trial and error. But the Psalmist reminds us that some problems are not solved – they actually evaporate through music. When we feel unhappy or sick or hurt, the harp may be the answer. Music has the amazing power to go beyond words. It allows us to express deep-rooted feelings in ways that words cannot. My parents bought me my first guitar when I became a Bar Mitzvah, and since that day I have never stopped playing. This year, for the first time in my rabbinic career I played guitar throughout the Rosh Hashanah and Yom Kippur services in Wildwood New Jersey. The instrumental accompaniment infused the service with palpable energy and resounding participation from the congregation that was as moving to me as it was to them. They said they were drawn into the prayers, and the hours flew by like minutes. Now that the holiday season is past, I have returned to my part-time work as a music therapist for patients receiving palliative care. I play my guitar, I sing for (and sometimes with) them, I encourage them to keep the beat with rhythm instruments, to make any special requests, even to talk about memories that the songs evoke. Very often, the music unlocks memories; sometimes people who have not spoken in a very long time sing or hum along, or smile, or cry, or keep the beat. Sometimes family members join us and are gratified to see their loved ones engaged in ways that they are not much of the time. My teacher the late Abraham Joshua Heschel writes that the function of music is to help us to live through a moment of confrontation with the presence of God. The role of humans is to be the voice of God’s glory. A song is not only an act of expression but also a way of bringing down the spirit from heaven to earth. It is said that King David found answers to life’s mysteries when he played on his harp. Through my work today I was blessed with such a rare transcendent experience. As Rabbi David Wolpe reminds us, sometimes when the music begins, our questioning grows quiet and the air swells with a meaning far beyond words. May you also find the music and the meaning in your life.